Just a small selection of the available shells! We recently took a quick getaway to Sanibel Island – about a 3 and a half hour drive from Orlando. The small island of Sanibel (only 12 miles long and 4 miles wide) is located off of the coast of Fort Myers in Florida. I have lived in central Florida off-and-on for over twenty years but had never ventured to this side of Florida. I am glad I waited until now so that my small dog, Bodie, could come! 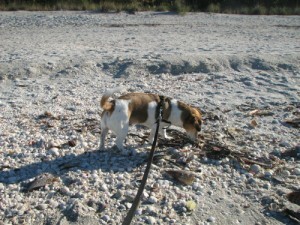 We had a great day at the beach – all the beaches on Sanibel are dog-friendly! There’s no loud music or spring-breakers and cars aren’t allowed on the beach (unlike in Daytona!). Instead, Sanibel is unspoiled and natural. It is a top destination for shelling – all along the beach are piles and piles of shells to be sorted through (go at sunrise to get the best ones!). 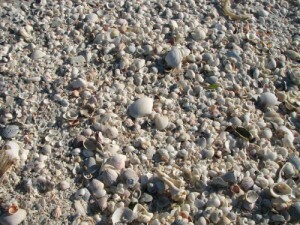 But it isn’t just a shelling beach – there’s still plenty of sand. There’s a long list of pet-friendly accommodations – mostly small motels or cottages. Don’t expect over-the-top luxuriousness – head to the other coast for that. Instead, everything is small and quaint, and authentic Floridian – the way it used to be. There’s no traffic lights on Sanibel (but two traffic cops instead) and you won’t see very many of the big chains on the island. I think Dairy Queen was the biggest name that we saw! Instead, there are plenty of good restaurants and cafes and most allow dogs on their patios (check out Over Easy Cafe and their delicious breakfasts served until 2pm!). 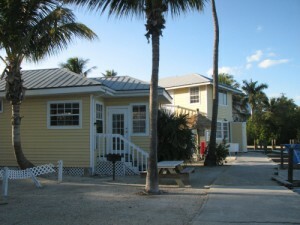 A couple of the Castaways colorful cottages! We stayed at the Castaways Beach and Bay Cottages. The units were cute and the location was peaceful and quiet (on the northern tip of the Sanibel – right next to the small bridge to Captiva Island, a more remote and residential island). Castaways review – with photos! If you need assistance planning your next vacation, please just email me with your request. I am a travel agent who specializes in pet travel (and human travel, too!). This is great information, and will come in handy as we plan our first roadtrip of 2010, which will include Florida!! Sanibel looks lovely and the kind of relaxed attitude you describe is exactly what we’re looking for! It’s fantastic that they’ve made the beaches dog friendly! Thanks for this post on Sanibel Island. I also live just 3 hours away in Delray Beach and while I’ve been to this delightful island many times on my own, I have not taken my dog to Sanibel because I was told it was NOT dog friendly. Thanks also for the wealth of information on international travel. I’ve been considering a trip abroad but was hesitant to travel with my little dog. This site and the links you’ve provided have given me a different take on long distance travel with my Buddy.